Lyla June Johnson joined us last month at the Lincoln Memorial from her ancestral homeland of Diné Tah, what the Mexican-American War, through violent conquest, defined and delineated for us as the states of the American Southwest. The Mexican-American War was a war that American general and president Ulysses Grant would describe in his memoirs as: “one of the most unjust [wars] ever waged by a stronger against a weaker nation” and “I do not think there was ever a more wicked war…I thought so at the time…only I had not moral courage enough to resign.” I’m convinced that Grant’s life and soul were irrevocably and forever wrecked by the moral injury he sustained from his participation in the Mexican-American War. However interesting it would be to think on how that war effected Grant and drove him in the years before, during and after the Civil War, Grant is not the purpose of this post, Lyla is, and by extension, my own inability to act fully on my own feelings and beliefs for too many years. Here is my speech at the Lincoln Memorial. Please listen/watch both and note the difference. I’d like to be more like Lyla. Thank you to Chris Smiley for filming all the speeches and music performances at the Lincoln Memorial and at the White House. You can watch all the videos here at Chris’ Youtube channel. Note that the title of this post is True Strength. I see that strength in Lyla, as I see it in so many of my comrades in the Peace and Justice community, so many of them women, I would say most of them women. Not discounting my brothers, but many of the most influential people on me, these past years of my life, have been women, my sisters. I see that strength so especially when women like Lyla are willing to see the war-mongers and war-profiteers and pray for them, when people like Lyla seek to heal those whom I decry and detest. Where I want to tear down, set ablaze and destroy, where I want to let loose and satisfy an anger, a hate, a desire for bloody and savage revenge that haunts and cripples me, Lyla looks to comfort, to fix and to sooth; her way brings peace. Inside of me the cycle of violence is still spinning, and that weakens me so that I can never be strong, so that I can never recover, so that I can never find relief and rest. Only when that cycle of violence is truly broken, and to do so, the entire cycle must be embraced and touched, as Lyla demonstrates, can peace and justice be achieved. In order to do so, to break the cycle of violence, both within ourselves and within our societies, True Strength must be had. With that in mind, this notion of strength and the unfortunate, and all too frequent absence of it, I want to share a talk I gave at the semi-annual conference for the National War Tax Resistance Coordinating Committee in St. Louis last month. For a long time after my resignation from government service and the war in 2009, I hedged on my actual feelings of aversion to the war, my sincere moral disgust with the killing, and my honest intellectual rejection of war and violence as a solution overseas and at home. I had harbored these feelings and beliefs for a long time before 2009. I hadn’t believed in the necessity of the war in Iraq in 2003, my colleagues in the Secretary of the Navy’s office can attest to that, but I was overtly agnostic at best, and I certainly was not filled with any principled degree of resistance, as I had not been personally touched by that vicious cycle of violence that was yet to come, so my connection to the war was abstract and academic. As I explain in the video below, and in the video I talk about some personal history I have not shared before, some things I discuss go back to high school and the first Gulf War, my ability to lie to myself during my time in the Marine Corps, during the wars, to make excuses, to justify and incur responsibilities and obligations that required me to look past the immorality, the illegality, the lies, the simple WRONGNESS of the wars, in retrospect, was breathtaking. For example, if I were not to take command of Charlie Company, 4th Combat Engineer Company in 2006 when that opportunity came about, then other, less capable, less competent officers would take command which would risk Marines and Sailors to get killed; so I volunteered, accepted the command, went to Anbar Province and back to a war I knew was corrupt and was wrong. And on and on the justifications and excuses would go on, for years they went on, cloaked, camouflaged, and be-knighted with responsibility and obligation for the lives of others, all this moral justification in my head to allow my participation in an immoral war. What my point in that reflection at the war tax resistance conference in St. Louis was how after I left the war and government service is that I continued to hedge my actions in relation to the wars. That rather than being set free, as I thought I might have been, I still aspired to be a part of the establishment, to be a part of something that “mattered” because I wanted to influence and have an effect on a peace process in Afghanistan, something that if I had the courage to look at what really existed in my mind and in my heart I would have known did not not exist from the American government’s perspective. However, at the time, my thoughts were that I could somehow play a role as an outsider and go back into government service at a later point, as many who resigned in protest of the Vietnam War did. I thought maybe I could play a role in the negotiations that I suspected may be occurring, although I had no idea to the level that they were actually occurring with the Taliban, although with American involvement – again our government, the United States, being the greatest obstacle to peace in Afghanistan. I kept my true feelings about war and violence in check, determined to be a realist and a professional, but only contributing to and engaging in a fraudulent and rigged game, perpetuating an industry of war and a phony intellectual foreign policy and defense establishment in Washington, DC, a community whose only requirement for entry, promotion and prominence is allegiance and a pronounced demonstration to the greater good, or should I say God, of the war industry. In my earliest talks and writings upon my resignation from the war, I believe I was more earnest in speaking for US withdrawal from the war, but as my belief in possible reconnection with the establishment, and my position with a think tank began, my views became more moderate, more reasonable, more sensible…i.e.. more palatable to Washington, DC and to the money that keeps the city and its people afloat. I’m no longer in DC. I’m no longer captive to those interests. I also don’t make a ton of money any more, more like no money ;), and I now live with my family again in NC. But I have strength in my heart, in my mind and my soul. I owe that strength to many people. A lot of it to one lady in particular: Diane Baker; who may be the strongest person I’ve ever met. It was meeting her in Dallas in the summer of 2012, staying with her and her husband Tom that really shook me and made me realize that I was a coward for not embracing and articulating what I actually knew and believed about violence. It was never anything Diane specifically said, but just who she was. Her presence, the dignity with which she spoke and carried herself, and her commitment to life and peace. I haven’t been the same since I met her. Now, to be sure, Diane was no magic potion for me, and there is certainly still LOTS wrong with me, but I feel the last many years I have written, spoken and acted much more forcefully and honestly than I did prior to staying with her. If you have had someone like that in your life, and I believe we all have many people who have influenced us in many different ways, make sure you tell them. Here is my talk at the War Tax Resistance Conference on hedging on my own morality. I hope this will help and maybe inspire some other people. Please take this talk for what it is worth, but at the very least for an understanding that life is very truly a journey. Today, typing this in a coffee shop in Durham I am living the values I imagined living as a 17 year old high school student. 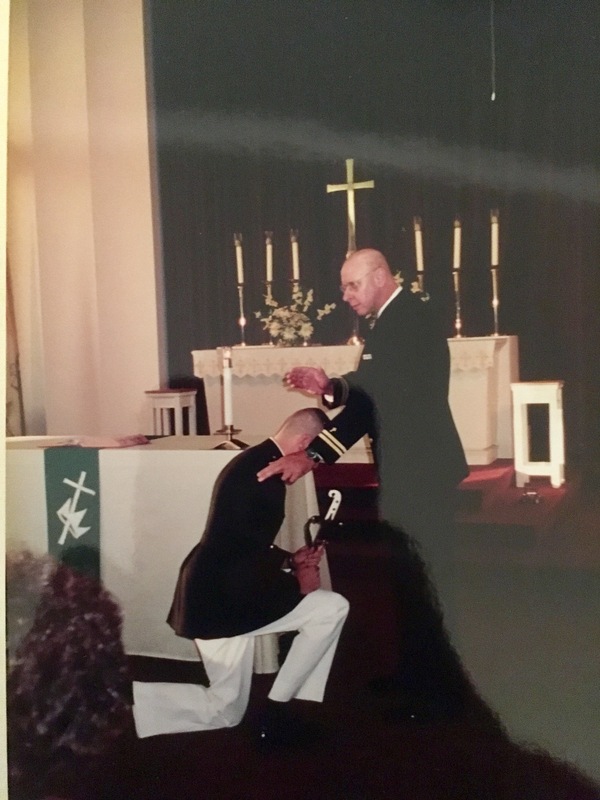 For anyone looking for a graphic depiction of the institutionalized militarization of Christianitity and/or the institutionalized Christianization of the American Armed Forces, I wanted to share this photo of me, a second lieutentant in the Marine Corps, getting my sword blessed by a Navy Chaplain as part of an official sword blessing ceromony for newly commissioned officers in 1998 at the Quantico Marine Corps Base Chapel. Feel free to share or use this photo as you wish, particularly with those who argue that Islam is the only religion that is utilized for murder, conquest, greed, violence, profit, control, demagoguery, pillage, brainwashing, etc.